After over six years in development, the compact disc was officially launched in October 1982 accompanied by a small range of titles including a CD version of Abba’s final album, The Visitors. The commercially released version of The Visitors was a slightly modified version of the prototype versions which had been circulating within the record industry earlier that year. For a start, the text print on the CD had been changed to exclude track running times so that there was more space for producing and publishing credits. The digits in the title’s catalogue number had also been reshuffled to follow the familiar pattern adopted by all PolyGram CD releases until the late 1990s. In addition, it is possible that the actual mastering on the disc was also changed – early reviewers of the disc had observed that tape hiss was audible during the segue between Slipping Through My Fingers, which was recorded on analogue equipment, and Like An Angel Passing Through My Room, which had been recorded digitally. This hiss isn’t evident on the commercially released version of the album. One thing that remained unchanged was the bright red coating applied to the disc during the manufacturing process, which is so prominent that early Polydor CDs are generally referred to as Red Polydors or Orange Polydors by collectors. Abba on CD doesn’t normally take scans directly from other sites but this beautiful scan from Maggot clearly shows the deep red coating used on early Polydor releases. 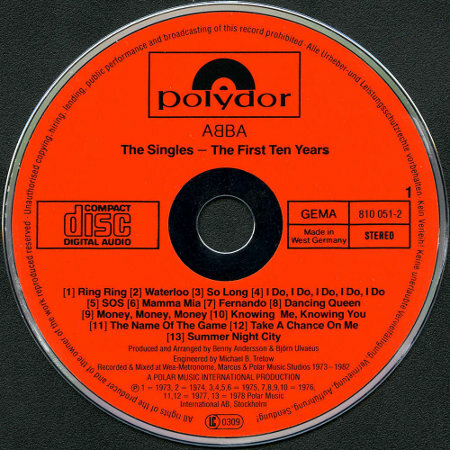 Polydor obviously believed that there would be healthy demand for Abba titles among early adopters of the new format and three more Abba titles soon appeared: Super Trouper, Greatest Hits Vol 2 and The Singles: The First Ten Years. Meanwhile, the following year saw the release of two recent Abba solo albums, Frida’s Something’s Going On and Agnetha’s Wrap Your Arms Around Me on the new format. Although all these titles received a standard release in the European territories where Abba records were released by PolyGram, they are quite rare today. This is largely because PolyGram phased out the red coating on its Polydor CDs during the latter half of 1983. In general, a Red Polydor title can achieve up to €100 in online auctions. Although the packaging of these early titles was practically identical to their later more common equivalents, it has emerged that some early copies feature a longer barcode than later, less valuable, issues. Titles in range: The Visitors [retail version] (800 011-2); Greatest Hits Volume 2 (800 012-2); Super Trouper (800 023-2); The Singles: The First Ten Years (810 050-2). Release dates: The Visitors [retail version] (October 15, 1982); Greatest Hits Vol 2 (October 1982); Super Trouper (November 15, 1982); The Singles: The First Ten Years (late 1982). O.K now i am clear there some commercially available CD’s available in late October 1982. I am still not clear,based on this or anything else I read elsewhere as to exactly what month the first ABBA CD’s were commercially available?